Secure Your Booth Today! Fans Will Step Into the World of Animation. 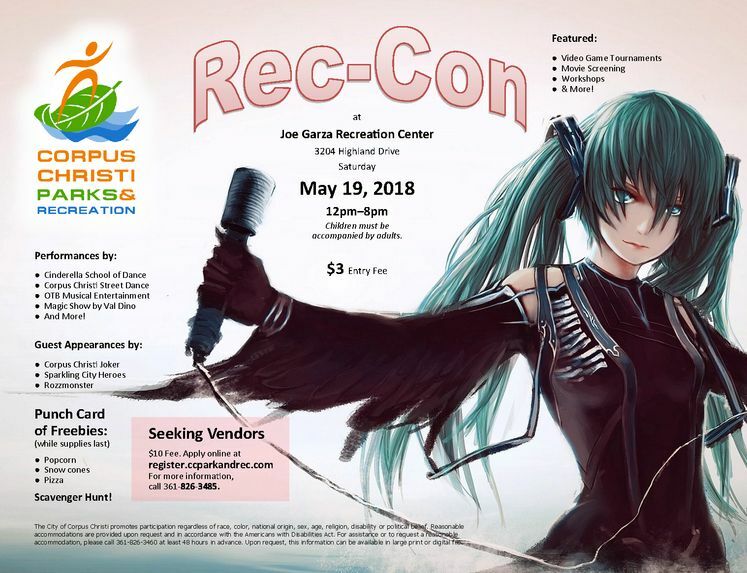 CORPUS CHRISTI, TX – The Corpus Christi Parks & Recreation Department is excited to host its third Rec-Con event on Saturday, May 19, from 12:00 p.m. – 8:00 p.m. at Joe Garza Recreation Center located at 3204 Highland Avenue. Join other anime, comic, and superhero fans at this exciting event. Entertainment will include OTB, Cinderella School of Dance, Corpus Christi Street Dance, a magic show by Val Dino, and more. Try your hand in the card tournament, or test your skill among other gamers in the video tournaments which will include Mario Smash Bros, Injustice 2 and Arms. There will be a movie screening and workshops throughout the afternoon. The Corpus Christi Joker, the Sparkling City Heroes, Rozzmonster and others will all make guest appearances you won’t want to miss. So, dress up in your favorite cosplay or anime character and come mingle with other fans in our community. The convention fee is $3 and the event is open to all ages. Children must be accompanied by adults to attend. You will be given a punch card for freebies like popcorn, snow cones, and pizza while supplies last! We are currently seeking vendors. Secure your booth now for only $10. To register, visit https://register.ccparkandrec.com/CourseActivities.aspx?id=47. For more information, call (361) 826-3485 . Reasonable accommodations are provided upon request and in accordance with the Americans with Disabilities Act. For assistance or to request a reasonable accommodation, please call (361) 826-3485 at least 48 hours in advance.